The main contributor… burnout. In this post, we’re examining the latest information surrounding physician burnout, what’s being done to combat this trend, and solutions to achieving a work-life balance. Physician burnout is at an all-time high, reaching critical levels. Burnout is defined as loss of enthusiasm for work, feelings of cynicism, and a low sense of personal accomplishment. When a family physician exhibits these feelings, they can overflow into patient interactions, ultimately jeopardizing the quality of care. In Medscape’s 2016 Lifestyle Report, over 15,800 physicians from over 25 specialties provided surprising responses related to burnout. 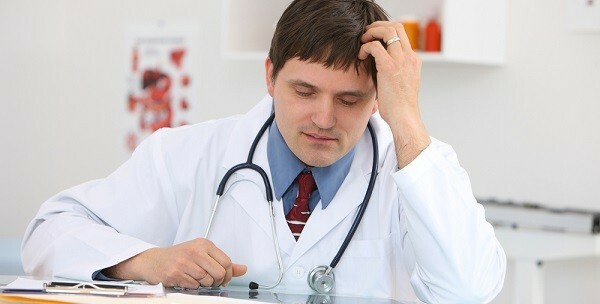 Over half of family physicians (54%) reported feeling burnt out. When asked to rate the severity of their condition, FPs rated an average of 4.4 out of 7 (7 being that my burnout is so severe that I am thinking of leaving medicine). Family physicians specifically cited that insurance and ICD-10 coding issues were also causes of burnout. When asked to rate their happiness at work, only 28% of family doctors reported being happiest when they are at work. What’s reassuring to note is that when asked if they could go back in time and pick another career path, 56.4% said they would roughly do everything the same as they did the first time. It’s one thing to experience high levels of burnout on a regular basis; it’s another when you lack the resources necessary to reverse this trend. According to a survey conducted by the Studer Group, 66% of physician respondents feel they do not have the tools or resources they need to combat burnout. Moreover, 54% feel their leadership does not do enough to help prevent burnout before it starts. A lot is being asked of physicians on top of the care they already deliver. And as patients live longer and the computerization of medical practices becomes more complex, the demand for dedicated, energized physicians is growing, putting greater stress on healthcare providers currently in the field. Physicians would like leadership to not only give them access to educational programs to address key areas of burnout, but to also give them a greater say in operational decisions and more leadership opportunities. Steps Forward is an interactive practice program that addresses four areas affected by burnout: practice efficiency and patient care, patient health, physician health and technology and innovation. For additional resources, the American Academy of Family Physicians (AAFP) provides a list of helpful articles and organizations that serve the needs of residents and physicians suffering from burnout. In addition to receiving help from leadership, physicians may also receive aid from the very patients they serve. Citing changes in regulation and the implementation of Meaningful Use, a Wall Street Journal article suggests that by having patients co-author their own clinical notes, physicians will have reduced clinical pressures, resulting in less time spent on administrative duties, fewer burned out doctors and more engaged patients. Family medicine has become increasingly complex, and it’s future remains uncertain — a perfect recipe for stress. And as you may know, stress can impair decision making, cognitive abilities, memory, and attention. While internal tools and resources are helpful, you may need to take matters into your own hands in order to achieve the work-life balance you seek. To be successful, examine all aspects of your life and see where you have the most control. By understanding and defining your priorities, you can see where you can put your energy and learn more about what matters most to you. While you may practice in a fast-paced, high-demand environment, you need to realize that you can’t do everything. Pace yourself and don’t be afraid to delegate certain tasks to another staff member. When you are outside of work, try to create boundaries. If you made the effort to leave the office on time to have dinner with your family, don’t check your work email at the table. In the end, physicians who have greater control over their practice, their patients and their personal life are less likely to suffer from burnout, resulting in improved health outcomes. Tell us: What do you do to reduce stress or maintain a healthy work-life balance?